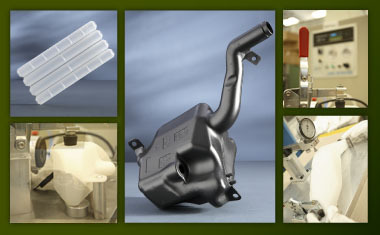 The production line of tanks by blow-molding can satisfy a wide range of industrial demands: plastic tanks for automotive, motorcycle and cars, fuel tanks, oil tanks, as well as tanks for electrical household appliance, that are produced by FISEM thanks to the experience gained cooperating with prestigious international companies. The greatest flexibility and high quality characterize the manufacture of tanks. The cooperation with the customer starts from the very first drawings and the production area is organized so to meet the requirements about quality and delivery time indicated by the customer. The tank area is made up by modern blow-molding presses of different capacity and many working centres for drilling and cutting operations, supported by advanced checking room equipment to warrant quality products according to drawing specifications.